When you have completed review of this screen, please click the "Next page" blue arrow for the second portion of this section. The AP view is not commonly obtained because the spine sits in the middle of the cineangiographic picture in this particular view and the coronaries lie directly in front of it. The similarity in radiographic density between the spine and the contrast-filled coronaries interferes with the quality of the images. However, it is occasionally obtained when the location and severity of a stenosis cannot be clearly defined in the conventional views. The AP view may be of particular value in evaluating the ostium of the left main coronary artery and the shaft of the mid LAD. 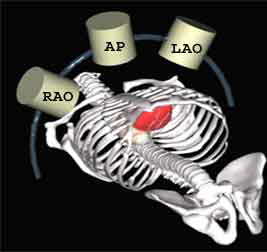 The AP view is of historical interest and goes back to the early days of cardiac catheterization, The x-ray tube, image intensifier and camera remained stationary, while the patient lay in a cradle that was rotated from the RAO to the LAO projections. Cranial or caudal angulation were not possible at those times. The AP view was often the first "scouting" view. The central or "neutral" position of the camera is known as the AP (antero-posterior) view, at which time the camera "looks" straight down the patient's chest and heart. 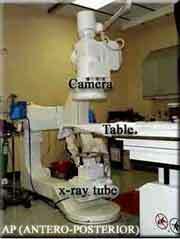 In other words, the X-ray camera is directly above the patient's chest with the beam coming straight up from the x-ray tube and perpendicular to the patient (below, left). A camera's view of the patient's heart in the AP view is shown on the right (below). The size of the heart has been purposely exaggerated for purposes of illustration. The aortic valve has three cusps. The RCC or right coronary cusp, where the right coronary artery originates and the LCC or left coronary cusp where the the left main (LM) coronary artery arises. The NCC or non coronary cusp sits posterior to the other two cusps of the aortic valve. 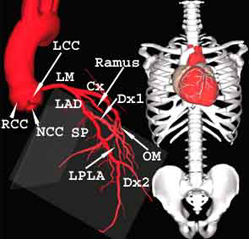 The LM divides or bifurcates into the left anterior descending (LAD) and the Circumflex (Cx) coronary arteries. In many cases there is a third artery that originates from the LM and travels between the LAD and CX. This artery is known as the Ramus Intermediate (Ramus) or Optional diagonal coronary artery. In the AP view the LAD runs down the front of the heart along the side of the spine. The ramus and diagonal (Dx) moves diagonally and away from the LAD and the spine in this view. When more than one Dx is present, the first one is called the first Dx or Dx1, the second is called Dx2, etc. The septal perforators (SP) are smaller branches that come off the LAD. They supply blood to the inter-ventricular septum. The Circumflex (Cx), in the AP view, moves away from the spine at nearly a 90 degree angle and then wraps around the left atrio-ventricular groove to the back of the heart as was previously described. The Cx gives off one or more obtuse marginal (OM) and left postero-lateral branches (LPLA) that run downwards and away from the AV groove. When more than one OM branches are present, the first OM is called OM1, the second is called OM2, etc. The picture on the left (above) shows the left coronary artery rotating back and forth between the right and left anterior oblique position (RAO and LAO) as the x-ray tube swings in a plane between the right and left sides of the patient (as shown on the right, above). Click on the buttons below the animation to see labels of the various views.